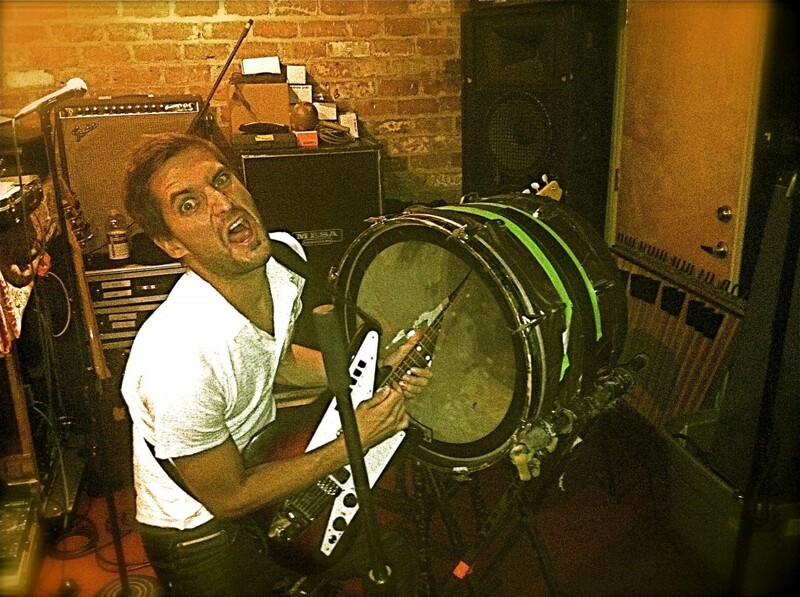 So this has been brewing for many months now, but I’m proud to say that I’m officially the new guitarist for MUTEMATH. It’s an awesome time to join them, for many reasons of course, but especially because their newest album, Odd Soul, is some of my favorite stuff they’ve done to date. And it kicks all kinds of tail, all over the record. We’ve rehearsed for several weeks now, and the new songs have an incredible energy live. My first show (and their first show with the new material) was supposed to be in Tulsa, Ok for a festival with The Flaming lips just a few days ago, but right before we finished our soundcheck, literally just a few minutes before we kicked it off, a crazy thunder/hail/sideways rain/g-force wind storm sprung up on us and pretty much destroyed the stage, along with a bunch of The Flaming Lips gear, including a massive video/lighting rig (which crushed a fence as it fell). There are several vivid videos on youtube documenting the crazy…. —-that huge metal tower to my right completely blew over just a few mintues after this video was shot- i was right next to it. Needless to say the show was cancelled. So instead my first show with them looks to be in Tokyo/Osaka, Japan for the Summer Sonic festival in just a few days. The rest of the band has been there a handful of times already, but it’s my first time visiting Japan, so I’ve got a lot of newness to take in over the next week. I’m honored to be playing with them though, and I’ve been beyond impressed by their musical prowess. I’m sure I’ll have plenty of fun updates for you in the near future. For now, here’s a picture of our recent practice space, and one of me getting a little too hyped up and destroying one of darren’s drums. This entry was posted in News on August 10, 2011 by Todd Gummerman. Came to your site through Stumbleupon. You know I am signing up to your rss. I hope you all arrived back home safely! I am Epi whom you in Osaka along with Chi and Erica while you were playing billiards with Abe in the hotel. Although we just discovered you guys this weekend, we are LOVING your tunes! Keep it up! I can’t wait to see you again in concert! Since no other MM fans seem to have posted yet, (since we have not got to see you perform yet) I wanted to drop a line of encouragement. We have all respected the bands choices since after Earthsuit, the Reset EP, the Teleprompt/WB choice, taking time on Armistice and now Odd Soul. If they love you, then I know we will. It has to be hard jumping into a pivotal spot with a band who does not rely on mainstream radio for sales but from their MASSIVE fan index. More fans of MM know things about them, then I would venture to say that top 40 fans know about one-hit wonders. We all love MM and are in it for the long-haul and it looks like you hope for it too. My Friend and I are prepping for our 14-hour round trip to come see you all in Mobile tomorrow night coming from N Atlanta. I wish you the bestest of bests in this new endeavor and I hope you really impress all of these die-hard MM fans! I am so excited to bring new members of the fan community to meet the new member of the band we love. Thank you for coming Japan! I went to Roy’s fan-meeting at Fender Showcase Tokyo, and Summer sonic Osaka. I’m looking forward to your next visit. Hey man. Great job tonight in mobile! Sounded great! I have to ask what guitar you spent the most time on? I though at a glance it was an Airline, but I’m not sure. The tele sounded sick too. It’s funny how versatile those little ibanez delays are! hello chris, thanks man! yeah i’m really fond of that guitar- it’s called a Galanti Grand Prix, and it’s Italian, from the 60’s. most people also ask about the buttons, and those just configure which of the three pickups you wish to employ. i started using it just for the sounds on this new record. that tele has been my main guitar for many years- it’s just so smooth and straightforward. i love it as well. and yeah- the de-7 pedal is one of the most underrated pedals out there. the echo setting is perfect, and of course the infinite delay is always entertaining. Hey man, excited to hear what you bring to the Mute Math stage. We’ll be checking you guys out in Poughkeepsie. Last time I saw the boys, it was the best live show I’ve ever been to, so needless to say I’m excited. I just wanted to ask the sort of awkward question: why weren’t you in the Odd Soul video? It looks like Roy is playing your guitar even. Was that uncomfortable? Did you play on the Odd Soul album? Curious on what the dynamic is. Thanks homey. Joe and I really enjoyed the Athen’s 40Watt show! I really appreciated you taking your time to talk to us (the fans) on your way out! I look forward to seeing MM in Knoxville. Weird. I saw the VH1 thing on Facebook, and was thinking. Man, that looks like Todd Gummerman, and there you have it. Congrats, man! Definitely a favorite band of mine. They made a good choice. I also got the opportunity to meet you after the show. So, thank you for taking the time after such an energetic show to dedicate even more energy to kick it with all us avid fans so late at night. Hope to see you again next year and lookin’ forward to your updates and news with the band. Keep up the ‘great’ work, Todd. Awesome….can’t wait to see Mute Math play in Australia! Hi Todd, I saw MuteMath in NYC earlier this year & the show was incredible! It was so nice to meet you, Paul, Darren & Roy after your set in Syracuse, NY last week (8/8), and your show was GREAT again but you didn’t have much time onstage since you were opening for JA so it was not enough! So I will be looking forward to seeing you headline again @ Higher Ground in VT end of Sept…. Thank you for such a wonderful live show, for being so pleasant and coming out to meet your fans, and best of luck to you & MM w/ Incubus & Linkin Park…. !